The Procedure Window is used to specify how the columns of data of the Data Window will be analyzed. 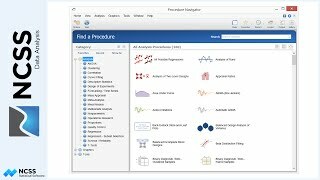 There is a separate procedure window for each statistical topic. The ways to select the appropriate procedure are shown in the Procedure Navigator video. For illustration of the attributes of a procedure window, we will look at the T-Test procedure. All other procedure windows will look just like this one except for the main specification area. We will examine the procedure specification area, the quick notes area, the menu, the button bar, and the guide-me bar. 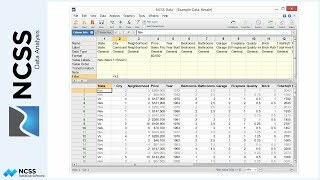 Starting with the specification area, the options on the various tabs are used to define which columns of the Data Window will be used in the analysis, specific attributes of the analysis, the reports and plots that will be given in the output, and how those reports and plots will be formatted. A variable or column is selected by double-clicking the variable box or clicking the column selection button. The column selection window shows a list of the columns of the Data Window. The starred columns are the empty columns. You can choose a column by double-clicking it or by selecting it and pressing the OK button. Or, if you already know the name of the column, it can be typed directly. Other aspects of the analysis are chosen with the various boxes, drop-downs, and checkboxes. The format of the plots is specified by clicking the larger plot format buttons on the plots tab. Another video is dedicated to the various plot format options. The small checkbox to the right of each plot format button can be checked to further format the plot with the integrated data when the procedure is run. As you mouse over the various options of the specification area, details of each option are shown in the quick-notes region on the right. More detailed help for this procedure can be seen by clicking the help button. The help chapter for this procedure will open in PDF form. This chapter will have an introduction to the topic, a technical details section, descriptions of the options, and examples with discussions of the output. Help for all other procedures and topics in NCSS can also be accessed from this window using the Help navigation pane. When you are finished with the desired specifications for the procedure, you can press the green Run button to run the analysis. The Output window is displayed to show the results. Now, we’ll examine the menu. The File menu items allow us to open and save procedure templates. A template holds all the specifications of the procedure window, including plot details. When a procedure is set up the way you wish for an analysis, it is often a good idea to save a template with that setup. The Open Example Template option is used to open preset templates that correspond to the examples of the documentation. The name of the example data associated with each template is given at the end of the template name. So if I wish to perform the Example 2 analysis, I would open the Example 2 Template, and then open the Pizza example data. I can then press Run to get the results for that example. The New Template or Reset item allows you to return all the procedure specifications to the default settings. The Run menu item performs the same action as the green Run button. The View menu items are used to hide or show the toolbar and the procedure info. Showing the procedure info is sometimes useful when creating Macros. 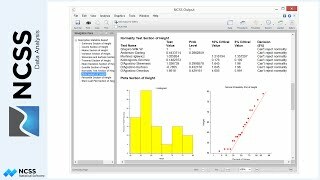 The Analysis, Graphics, Tools, and Window menu items are used to open other procedures or to show other windows. These menu items are the same as those of the other major NCSS windows. On the button bar, the buttons on the left give quick access to a few of the common File menu items. The buttons on the right are for opening other procedure windows or navigating to the data window or the output window. Up to six procedure windows can be open at a time. You can click the Loaded button to view or select all the procedure windows that are currently open.